While I was in Texas a couple of weeks ago, I took my nephews to the South Texas State Fair. We got there in time for opening ceremonies, where I patiently waited through all the hoopla to not only get in free, but to gorge myself on the most awesome of fair foods: The Pork Kabob. They don’t mess with veggies on these kabobs – it’s just a giant skewer full of marinated, slightly charred meat. The boys spent their entire evening riding ridiculous things like this, while I kept my feet planted safely on the ground and periodically gnawed my way through my dinner on a stick. When I got back to Kansas City, I made my way directly to the grocery store where I picked up several packages of country-style pork ribs. This cut of meat is can be found boneless, but does have a considerable amount of fat and connective tissue, so a little at-home carving is necessary before cooking. But worth it. So worth it. Trim the meat and cut into chunks. Mix ingredients in a large plastic or glass bowl. Marinate the meat overnight, or at least 4 hours. 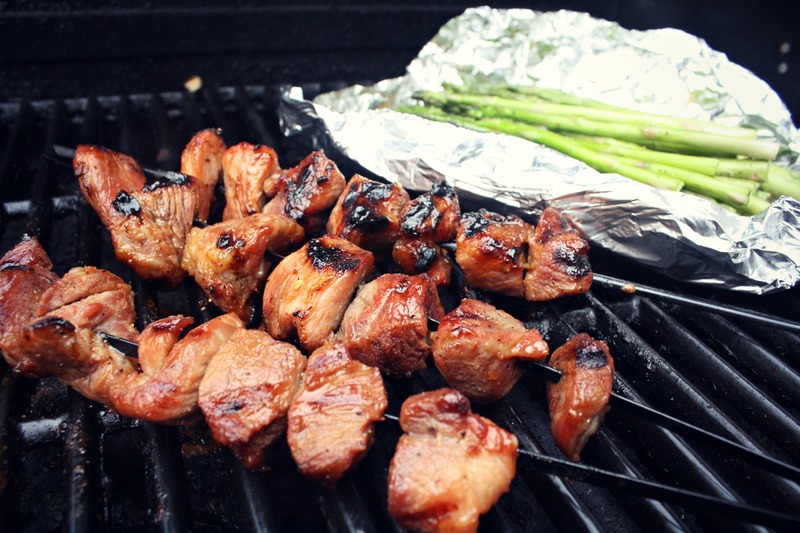 Grill the skewers over low heat for about 30 minutes, or until the internal temperature reaches 160 degrees, basting the meat with the leftover marinade occasionally. Low and slow is key when cooking pork, otherwise you end up with shoe leather. Oh my goodness, I could live on fair food. Holy cow. And I love making bbq pork ribs in the crock pot; this sounds right up my alley. Plus, kids love food on sticks! Yeah, I don’t understand why someone doesn’t open a “fair food” restaurant. Geez. OH MY! That was a close call. Meat and veggies. Touch. Oh lordy. My dad would have had a heart attack. I will have to add this to my must try list. I am trying to find new pork recipes that I like that arent tenderloin. Must keep the meat pure. 😉 I love to cook pork, mostly I guess because we grew up eating pork and rice and it’s my comfort food. In Texas, we don’t like to muddy our meat with vegetables! Exactly! Keep the rabbit food away from the people food. We like heat and pork! Yum. Double the Sriracha then. Oh my gosh. Nom. Thanks Jodi! And thanks for sharing it! You can do so much with it, really! And the flavor is a great canvas for experimentation.